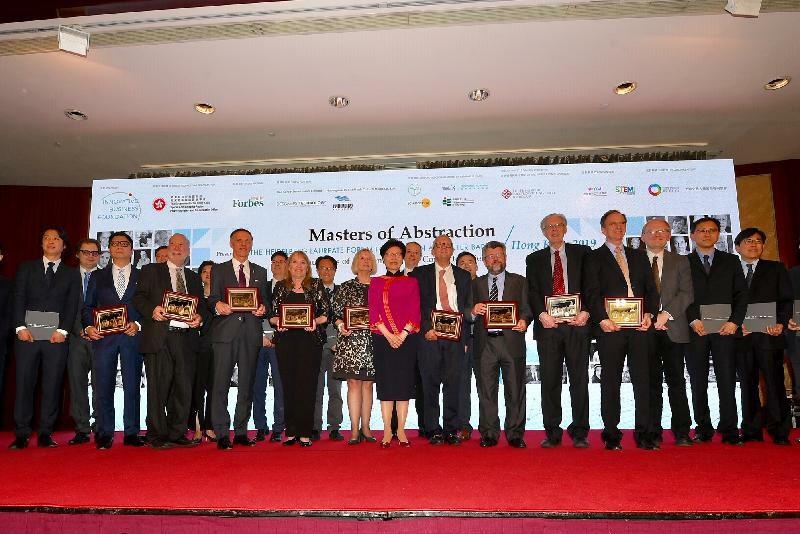 It is a great pleasure to join you for today's "Masters of Abstraction" Gala Dinner. Allow me, first, to welcome to Hong Kong the five Fields Medal, A.M Turing Award and ACM Prize in Computing Laureates here with us this evening. Each of you, through transformative research and scholarship, has made your indelible mark in the fields of computing science or mathematics. In doing so, you have profoundly shaped our world, our lives and our future. For that, we are all very grateful. My thanks, as well, to the Heidelberg Laureate Forum Foundation. The Foundation's annual Heidelberg Laureate Forum offers promising young researchers around the world the opportunity to interact with laureates of the three prestigious prizes I've noted, together with winners of the Abel Prize and the Rolf Nevanlinna Prize. For one week, they engage in free-flowing, cross-generational dialogue with esteemed laureates in Heidelberg, home to Germany's oldest university. And I am pleased to say that I said this with first-hand experience, as my younger son Joshua was a participant in the Heidelberg Laureate Forum in 2015. Last summer, I had the distinct pleasure of joining the annual Lindau Nobel Laureate Meeting in Lindau, Germany. I understand that annual gathering of Nobel Laureates and brilliant young scientists inspired the Heidelberg Laureate Forum founders. Together, the Lindau Nobel Laureate Meetings and the Heidelberg Laureate Forum connect the next generation of scientific leaders. That, ladies and gentlemen, resonates with my ambitions for Hong Kong, a city long celebrated for connecting companies from the Mainland of China and all over the world. Here, they trade and invest, do business, find partners and, ultimately, excel. My vision is to apply that business connect-and-excel model to innovation and technology. Indeed, since becoming Chief Executive of the Hong Kong Special Administrative Region in July 2017, I have placed innovation and technology development at the top of my policy agenda. To that end, I've launched an eight-pronged strategy to promote innovation and technology in Hong Kong. To date, my Government has committed US$10 billion towards a variety of innovation and technology initiatives, ranging from boosting research funding for universities to building a huge new science park in cooperation with the Shenzhen Government. Hong Kong enjoys full support from the Central People's Government under the "One Country, Two Systems" principle. For more than two decades, since the return of Hong Kong to our motherland, the "One Country, Two Systems" principle has given us benefits available to no other economy. As the multilateral business bridge between the Mainland and the rest of the world, Hong Kong has flourished in business and finance. And I have no doubt that singular advantage will help power our success in innovation and technology as well. World-class talent, of course, is essential to realising that vision. It's why, last June, we launched the Technology Talent Admission Scheme. It enables our technology companies and institutes to admit on a fast track basis overseas and Mainland technology talent in such technology areas as biotech, AI, cybersecurity, robotics and data analytics. My Government is equally committed to STEM education. We are determined that our future generations adapt and thrive in a technology-driven world. STEM education's success cannot be achieved in schools alone. Close co-operation between government, academia and technology companies is essential. And that collaboration must be both global and local, if we are to compete with the world in the 21st century of boundless opportunity. Which is why I am delighted that the five distinguished Laureates with us this evening will share their wisdom with young Hong Kong scientists and students at a university forum tomorrow. I'm hopeful, as well, that tonight will be the beginning of a long and mutually rewarding relationship between Hong Kong and the Heidelberg Laureate Forum. 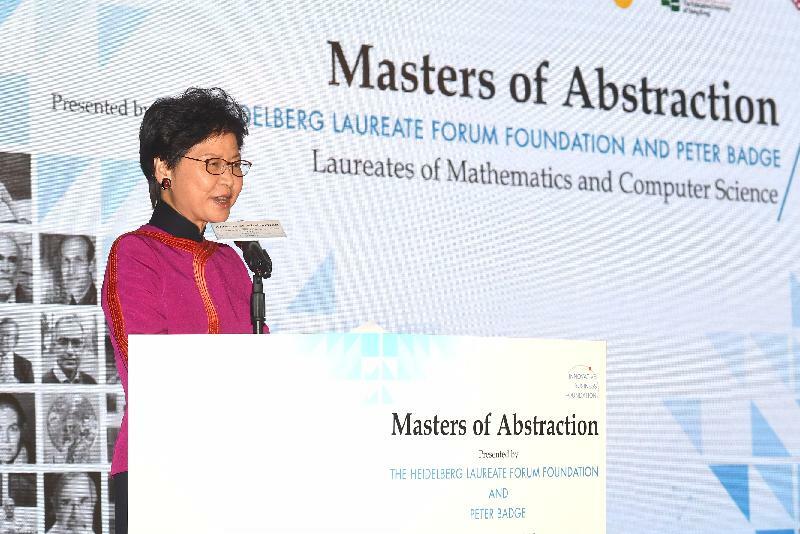 To that end, my Government, our universities and research institutes have been pleased to promote the 2019 Heidelberg Laureate Forum, which takes place this September, to our young mathematicians and computing scientists, encouraging their interest and participation. My thanks to Michael Ong and his Innovative Business Foundation for organising tonight's event and for his continuing efforts in promoting science and technology in Hong Kong. Ladies and gentlemen, I wish you all a very enjoyable evening and a New Year blessed with health, happiness and the universal blessings of scientific progress. Thank you very much.